Tube Tech is well equipped to manufacture integral finned U - Bent tubes, fabricated according to various heat exchanger standards or to customer's own specifications. We generally produce Finned U Bent Tubes in outer diameters 15.9 mm & 19.05 mm with wall thickness 1.32 mm and above. However, bigger sizes can also be accommodated on request. 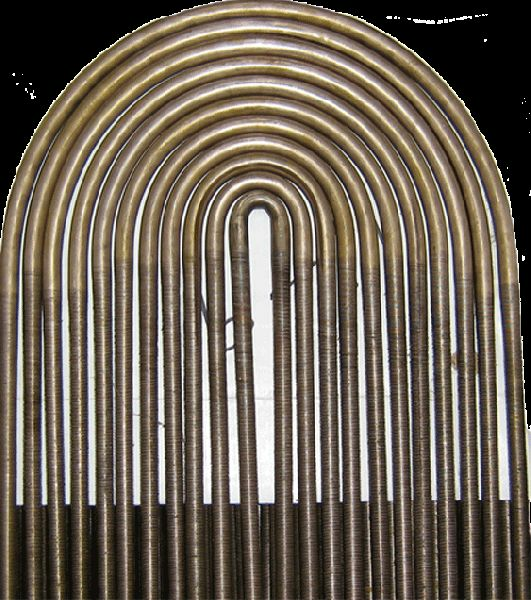 Bending radius of 1.25 X Diameter and above can be achieved on these integrally finned tubes. The Bend portion is left unfinned during finning operation to accommodate bending operation. The Finned U Tubes are produced, controlled and measured in accordance with SB 395 & TEMA standards. We are capable of producing Finned U Bent Tubes in the Leg Length of up to 5 mtrs. These Finned U Tubes are hydro tested after fabrication against any surface defects / leakages. We have in house stress relieving facility and these tubes can be heat treated for stress relieving, if required by the Customer. All tubes are cut to the specified leg lenght, ends deburred and the bores are internally cleaned with dried air before final inspection & packing. Each bundle is protected with plastic sheets. Detailed packing lists are attached to boxes to give quick and clear identification of contents.